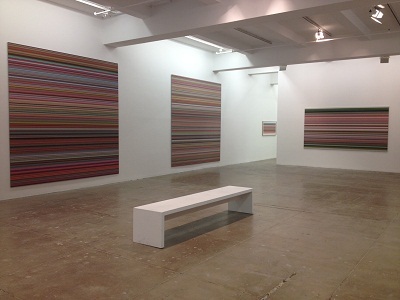 Image: Installation view, Gerhard Richter, PAINTING 2012, Marian Goodman Gallery. All photos by Maya Steward unless otherwise noted. 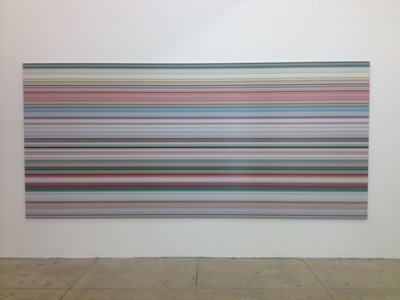 “The status of painting in [Richter’s] new works is figured as exceptionally fragile, yet it is powerfully formulated in its assimilation to its technological challenges, as though painting was once again on the wane under the impact of technological innovations,” writes Benjamin H.D. 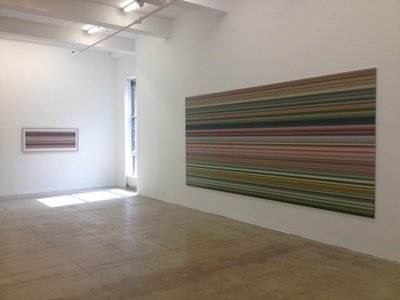 Buchloch of Gerhard Richter’s new works on view in the exhibition PAINTING 2012 at Marian Goodman Gallery. Working within the realm of digital imaging, Richter redefines the concept of painting once again, challenging the traditional application and boldly ascertaining both its methods and practice. 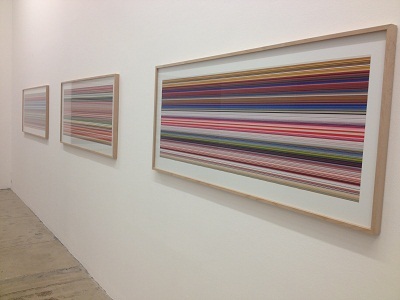 Richter uses digital software to compose his picture planes, layering band upon colored band to build up a complex network of patterns. 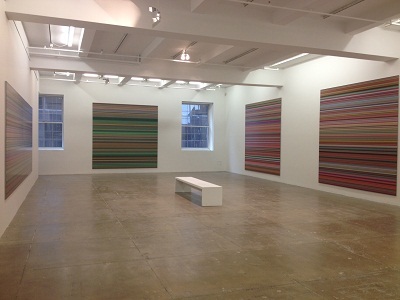 A single work, Richter’s Abstract Painting, 724-4, 1990, gives rise to all 19 paintings in the show. 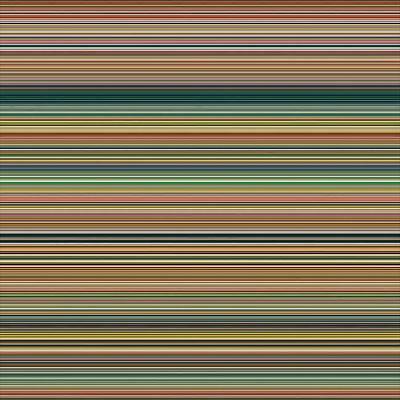 Working with strips of color from his earlier abstraction, Richter observes an exacting practice: slicing, mirroring, and repeatedly breaking down the colored bands into smaller and smaller striations. 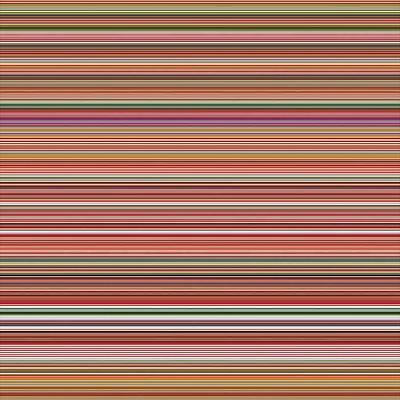 Richter then manually rearranges the developed patterns, creating wholly new ones, and riffs on the principle of chance, a long fascination of his. 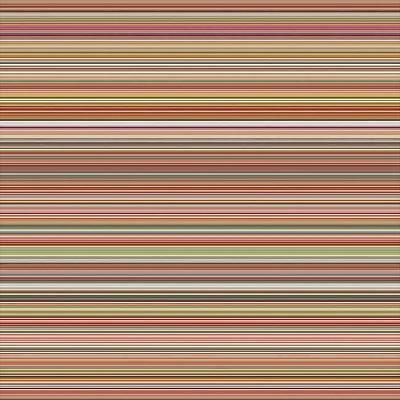 Once satisfied, Richter then rephotographs his creations and ends up with the digital prints on display; the final 8,190 striations maintain a sense of rhythm and ineffable order. 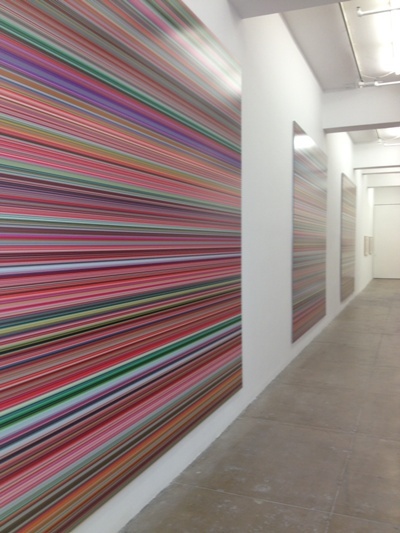 If painting is, on its most basic level, the idea of designing, composing or creating an image, Richter does just that. He does not negate painting’s rich history by implementing the tool of technology or working in the photo-digital realm, but rather endeavors within its framework, and pushes it to new limits. 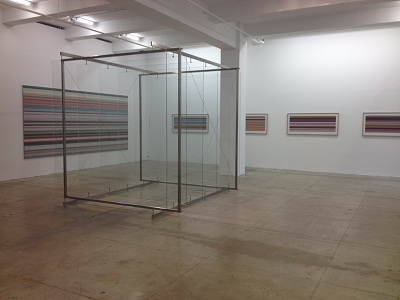 Displayed alongside the 19 strip compositions is 6 Standing Glass Panels, 2002/2011. 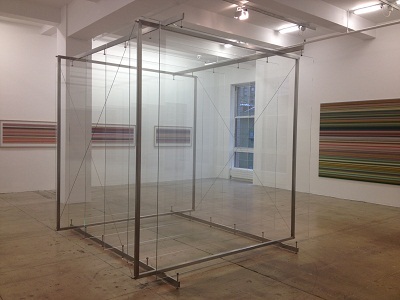 Having first used glass in 1967, the material has become increasingly significant in Richter’s work, particularly so in the last 10 years, in which he has created a series of three-dimensional free-standing glass constructions. Richter’s use of glass further unpacks the medium of painting by playing off the notion of the painting as a window to the world, or as art representing life. By virtue of this methodology, through reflection of both the space around it, as well as of the viewer, the glass takes on painterly qualities. It should also be noted that Richter encases some of his strip compositions on display in glass, and further deepens the interplay of his visual approaches and as painting as reflection. 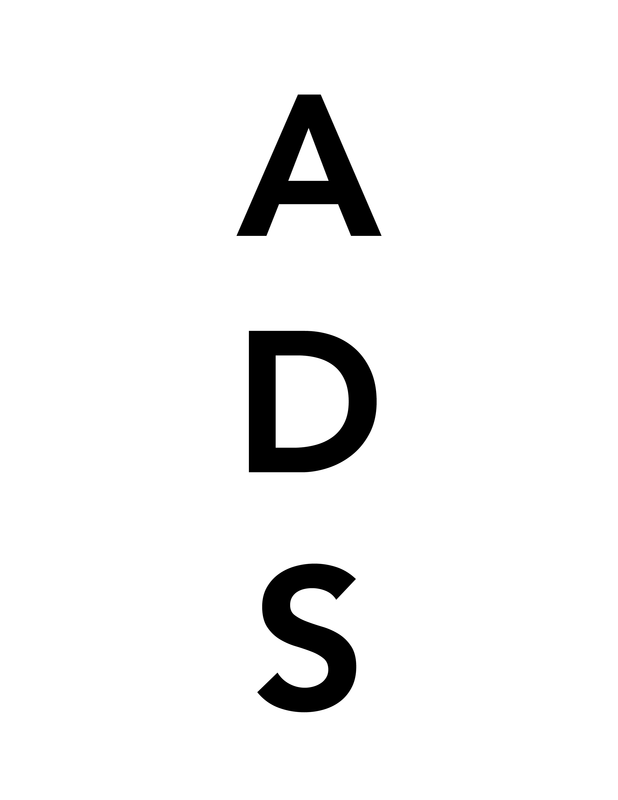 This entry was posted on Friday, October 5th, 2012 at 12:21 am	and is filed under Art News, Go See. You can follow any responses to this entry through the RSS 2.0 feed. You can leave a response, or trackback from your own site.